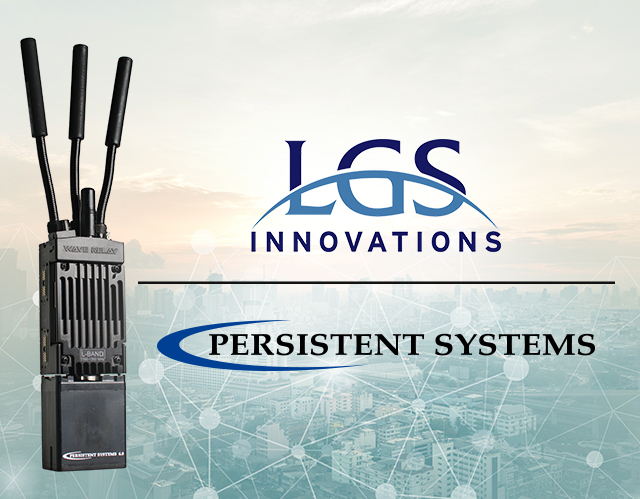 LGS Innovations, LLC (“LGS”) today announced a long-term partnership with Persistent Systems, LLC (“Persistent”) to incorporate Persistent’s Wave Relay® MANET technology into LGS’s portfolio of C4ISR, Intelligence, EW, and Cyber solutions. LGS delivers mission-critical communications products, research and development, and supporting services to create advanced solutions in wireless communications, signals processing and analysis, optical networking, photonics, cybersecurity, routing and switching, and spectrum management. Leveraging Persistent’s Wave Relay® MANET enables LGS systems to deliver highly reliable peer-to-peer wireless network connectivity to the last tactical mile – whether it’s airborne, ground, or subterranean – taking both offensive and defensive capabilities to a new level. Persistent and LGS have showcased their combined capabilities through numerous programs, projects, and U.S. government-focused events, such as U.S. Army CyberQuest and USSOCOM Trident Spectre. By incorporating Persistent’s Wave Relay® MANET with proven LGS technology solutions, electronic warfare operational cycles will see marked reductions along with increased performance and effectiveness. “Reducing timeframes for tactical EW operations increases effectiveness and reduces US force exposure, which is a win-win in dynamic situations,” said Adrien Robenhymer, Persistent’s VP of Business Development. This agreement cements Persistent’s line of Wave Relay®-based products as the preferred solution for LGS’s Mobile Ad Hoc Network (MANET) needs to connect Signals Intelligence; Command, Control, Communications, Computers, Intelligence, Surveillance, and Reconnaissance (C4ISR); cyberspace operations; and network assurance programs. “Coordinated and distributed operations that put LGS’s systems on the dynamic Wave Relay® MANET demonstrate how multimodal systems (manned, unmanned) increase precision in hard-to-reach places more than ever before. Our partnership with LGS represents a continuation of our vision of MANET-enabled sensors and architectures into advanced network operations,” added Robenhymer. LGS has Wave Relay®-enabled products and solutions that are immediately available for purchase. Please contact your LGS representative for additional information. LGS Innovations delivers mission-critical communications products, R&D, and supporting services to U.S. defense, intelligence, and civilian agencies and commercial customers around the world. We create advanced solutions in wireless communications, signals processing and analysis, optical networking, photonics, routing and switching, and spectrum management. These solutions drive mission success in Command, Control, Communications, Computers, Intelligence, Surveillance and Reconnaissance (C4ISR), cyberspace operations, and network assurance. LGS Innovations is headquartered in Herndon, Virginia, with offices across the U.S. and overseas. We employ over 1,000 associates around the world, including 750 scientists and engineers. LGS Innovations: Listen. Innovate. Deliver. www.lgsinnovations.com. Headquartered in New York City since 2007, Persistent Systems, LLC is a global communications technology company which develops, manufactures, and integrates a patented and secure Mobile Ad Hoc Networking (MANET) system: Wave Relay®. The company’s industry leading R&D team has designed wireless networking protocols to support their cutting-edge Wave Relay® system and technology. Wave Relay® transmits and receives data, video, voice and other applications under the most difficult and unpredictable conditions. Their suite of products is field proven and utilized in Commercial, Military, Government, Industrial, Agriculture, Robotics, and Unmanned System markets.